I feel like I missed out on lots of great foods just because they were different or unknown. If something looked gross or smelled strange, I just didn’t eat it. My mom had lots of foods that she didn’t eat, so I guess it didn’t seem weird to me at the time. Now I realize how much I was missing out on! Since I started WW in Sept 09, I have tried TONS of new foods, and I am finding there are quite a few things that I really like that I never thought I would. So, in honor of that attitude, I decided to make a rough interpretation of my Mom’s squash casserole. The true version would be done in the oven with a few more ingredients, but this was a quick and easy way to have a low point snack or meal (depending on the day)! 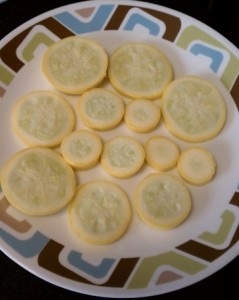 Start by slicing a summer squash and spreading it out on a plate. 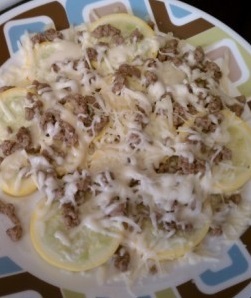 Add one serving of turkey sausage crumbles (Jimmy Dean pre-cooked) and two servings of shredded fat free mozzarella cheese. Throw in the microwave for a few minutes and enjoy! This yummy treat only cost me 4 Points+. If you don’t like fat free cheese, substitute your preferred type…just don’t forget to adjust the Points+ values! As I mentioned, this IS better in the oven. Cooking it in the microwave leaves the squash a bit crunchier than I would prefer. I suppose I could have just put it back in the microwave for a minute or two longer but I was HUNGRY and in a hurry! I made this after running 8 miles for the first time, so I didn’t have a lot of patience. I wanted to eat QUICK! Even with a little extra crunch, it was still delicious. Try it and let me know what you think!